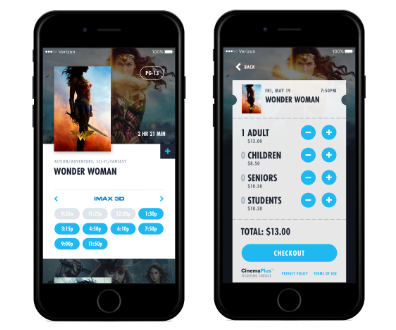 CinemaPlus is a simple to implement online/mobile ticketing platform that is compatible with your point-of-sale system and existing website. CinemaPlus can also replace your existing site with a beautiful, modern, mobile optimized site. Within 10 minutes, adding a simple line of code to any website, you are fully operational with an elegant solution, optimized for all devices and integrated into your point-of-sale system. Alternatively, if you prefer an entirely new website, we can replace your site with an automatically updated, elegant and responsive site within 48 hours. A single relationship to address your critical online/mobile ticketing needs and provide enhanced services to help you sell more tickets. A single line of code launches your service on your existing website within 10 minutes. From there, your ticketing functions are maintenance free and automatically updated so that your audience always knows what's showing, when it's showing and can quickly buy tickets from any device. Alternatively, if you'd like an entirely new online site, we can have you up and running within 48 trouble-free hours. Elegant and simple design, optimized for all devices and screens to meet your audience on their terms. Completely integrated to your point-of-sale system, you control your ticketing and recapture your direct relationship with your audience. Industry-leading transaction technology keeps your users on your website, with no redirects, and provides the most secure, fast and easy transaction completion available. Easily enhance your services with additional movie news & information, trailers, videos and more using our convenient add-ins. Advanced capabilities, including last-minute seat clearance and subscription membership options will help you fill more seats. Because CinemaPlus is cloud-based, upgrades and enhancements are quick & easy. When you need help or support with any part of our service, from help with your site to questions about transactions or ticketing, our helpful support team is just a call or email away. We offer a plan for every size operator, tailored to your needs. Are you ready to get started? You can be up and running within minutes. Give us a call or drop us a line.